Based on data the company said it collected on test and pilot farms, it bills the V300 as sporting a 10 per cent higher capacity, up to 50 per cent faster attachment time, up to 99.8 per cent attachment rate and up to 99 per cent teat spray hit rate. DeLaval said the new system also offers real quarter milking at a lower running cost than earlier systems and with a potential of up to 7,500 lbs. of milk per day. The V300 system operates with the DeLaval InControl user interface, a new system that allows the dairy farmer access to information and control of the system remotely. 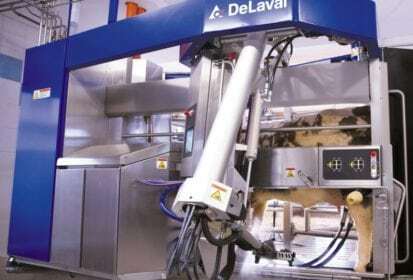 DeLaval said its system includes separate lines and containers for pre-milk and a cleaning operation — with “fully adjustable settings including the ability to add soap for enhanced cleaning” — to cut out cross-contamination. The company noted it plans to roll out DelPro Companion, a new mobile app for herd management, sometime this fall for Apple and Android devices on systems running DelPro 5.3 and later. Producers using either robotic or conventional milking systems can use the app to view cow lists, record data and remotely access a herd’s activities. “You can have a normal family life, and you can have normal working hours. Your employees can have normal working hours as well. It will be easy to be a farmer in the future,” Soren Hojgaard Andersen, a V300 farm owner in Denmark, said in the company’s release.